LiveConnections and the Wilmington Classical Guitar Society present classical guitarist Jordan Dodson. 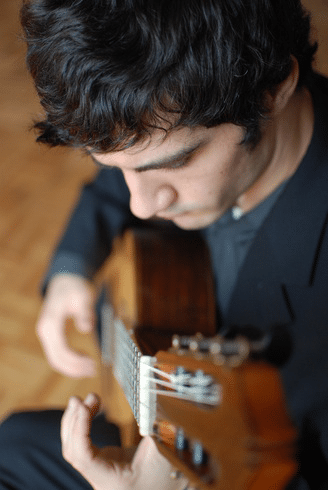 Named “one of the top young guitarists of his generation” by Performance Today, Jordan will present a solo recital of works new and old by composers including J.S. Bach, Antônio Carlos Jobim, Elliot Carter, Elliot Cole, Jason Eckardt, Dai Fujikura, Paul Lansky, Giulio Regondi and Gabriella Smith. See this rising star up close in the intimate Upstairs Live venue at World Cafe Live at the Queen, Wilmington, while enjoying a delicious brunch. Doors open at 11:00am for brunch and the show starts at 12:00 noon. Celebrating its fifth anniversary, LiveConnections creates innovative, boundary-crossing music programming and education. Our ClassicAlive concert series expands boundaries of classical music, presenting unique collaborations and fresh projects in the intimate atmosphere of our partner venue World Cafe Live. Jordan Dodson, guitar, has been called “one of the top young guitarists of his generation” (Performance Today). Dodson is an active soloist and chamber musician based in New York and Philadelphia. He has received prizes in numerous competitions, including the 2013 Astral Artists National Auditions, 2011 Lillian Fuchs Chamber Music Competition, 2010 Indiana International Guitar Competition and 2008 American String Teachers Association Competition. In 2013, he was a Young Artist in Residence on American Public Media’s Performance Today. An advocate for contemporary music, Dodson has commissioned and premiered dozens of pieces internationally. He is a performer in several New York City ensembles, including Ensemble Moto Perpetuo, Ensemble sans maître and Tempus Continuum. Originally from Columbus, Ohio, Dodson started playing music at a young age. He has studied with Clare Callahan, David Starobin and Jason Vieaux and received degrees from the University of Cincinnati and the Manhattan School of Music. In the Fall of 2011, Dodson was one of two guitarists selected to inaugurate a new program in classical guitar at Philadelphia’s Curtis Institute of Music.